Fiction. 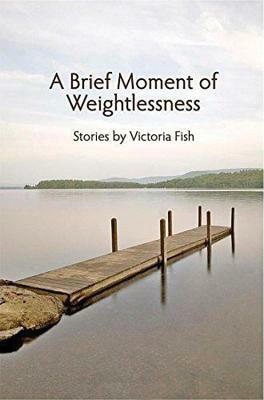 A BRIEF MOMENT OF WEIGHTLESSNESS is a collection of short stories that illuminate the beauty and extraordinariness of "ordinary" lives. Each explores the human desire for connectedness and grace. The stories range from large upheavals such as how a marriage shifts when a spouse loses a limb or how a girl reconfigures her world when her father goes to jail, to smaller moments such as when a woman experiences wonder again on a visit to a nursing home with her child and their dog, or when a man finds redemption in the midst of tragedy after being bitten by his dying dog. These illuminating, heartbreaking, poignant, astute stories take on serious issues of death/dying, injury, infidelity, aftermath of war, estrangement and more, but without a sense of gloom that could overwhelm them. They often, though not always, find that glimmer of hope or opportunity without feeling forced, and they are told in a voice that can cut to the quick of a character or conflict, with endings that don't always resolve neatly. If it is the small moments that make up a life, then these stories, explore, dissect and celebrate those small moments that make all of our lives extraordinary. "Victoria Fish's debut collection casts a spell so subtle and sure it could only be the work of a master storyteller. It is this talented writer's special gift to be able to unmask everyday reality, to distill la vie quotidienne to its essence and surprise us with the familiar. In rendering the struggles of ordinary people suburban moms and military vets and disdained little sisters she illuminates the stuff that makes us human, transporting the reader of A BRIEF MOMENT OF WEIGHTLESSNESS beyond the everyday to the sublime." Sara Tucker.